The Roman Empire has been well documented. Over the years written history and archaeology have brought to the surface, sometimes literally unearthed, a whole society. Thus Roman architecture, religion, military strategy and legal structures hold little mystery. Compared to this depth of knowledge, many of those living outside the boundaries of the Empire are lost in time. But now an archaeological excavation in the north of the Netherlands had begun to tell the story of the Roman's neighbours. At first glance the "De Bloemert" excavation, in the northern province of Drenthe and named after the holiday resort De Bloemert, seems an archaeological site like any other; dark colourations in the ground, people digging carefully, artefacts and broken pottery being photographed, nothing unusual. But according to Johan Nicolai, archaeologist from the University of Groningen and project leader of the excavation, this dig is very special indeed. Two things make it exceptional. First, the location has clearly been a good place to live since prehistoric times; one of the more spectacular finds was a grave dating back to the Stone Age, 2800 BC. Also the remains of late iron-age farms have been found, dated to 200 BC. After the Roman period from 0 to 400 AD an early medieval village existed on the spot. Dr Nicolai and his colleagues are delighted to be able to trace back human habitation here over a period of almost five millennia. But the aspect of the dig that has made the Bloemert instantly famous among archaeologists is the finds from the Roman period. They prove without a doubt that at the time this place was more than just a hamlet - it was a big village and centre for farmers and craftsmen, with an industrial area and international contacts. What is special about this is the fact that the village stood outside the Roman Empire  150km to the north of the border formed by the Rhine, in fact. In those days that represented many days of travel, and yet the finds from the Roman period indicate that there was a lot of contact with the Romans. To the locals these foreigners may have been intimidating - representatives of the Superpower of their time - but were also people with whom one could deal. As the excavation continues a fairly complex society appears. There were big, permanent farms, not the semi-nomadic type of the late Iron Age. Crops were grown for more than just local consumption, they were traded, exported even - the proof of that is the Roman money that has been found on site. Also there were big workshops, which produced goods for trade. The village's set-up is very modern; farms and houses were separated from workshops, the people went to work in the morning in a special "industrial" area. 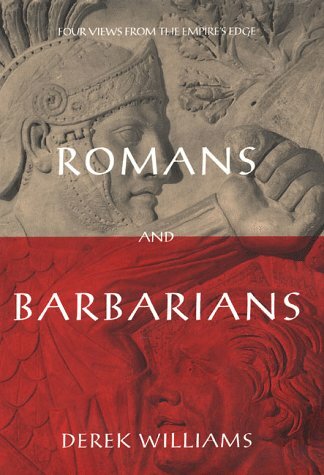 There is evidence that the inhabitants also appreciated the good things in life; beautiful pottery and weaponry has been found, imported from Gaul and Rome itself. It appears the old inhabitants of Drenthe were a far cry from the barbarians' we know from Roman authors. The search for these people will go on after the holiday resort De Bloemert' has reclaimed the ground. Archaeologists and historians want to know more; exactly how intense were the contacts with the Roman empire, how peaceful or tense were the relations, are there any written records to be found, was this village an exception or are there many more to be found? As always in archaeology every answer raises many more questions. But Dr Nicolai is a happy man. The find he'll remember most fondly is a wood-lined water-well he discovered at the dig. In this square well he found a wooden roman ladder completely intact, almost perfectly preserved after almost 1800 years in mud. "Suddenly this farmer from Roman times is almost standing beside you, he's accidentally dropped something in his well, climbs in with his ladder and then forgets the thing, history come to life."